Below are some snake prevention tips to keep snakes away from your home or property. In general, you can't be sure to keep snakes away from your house 100% of the time, unless you install a fence around the whole perimeter of the property, one with a fine enough mesh (no gaps) so that snakes can't slither through. 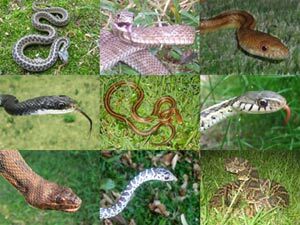 Other than that, eliminate the things that attract snakes - brush pile, wood piles, gaps under the deck or walkway, gaps under stone walls, gaps and holes leading under the house, heavy vegetation, tall grass, bushes, ponds, presence of rodents, or anything else that is attracting snakes. Some snakes will use any area, and there's nothing that you can do to prevent them. There is no effective snake repellent available, so snake trapping is a better and more effective option. 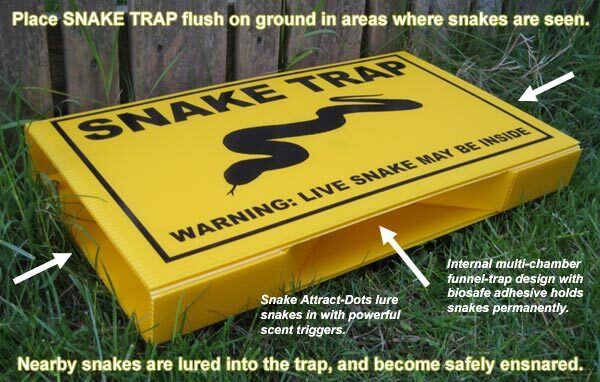 You can buy a snake trap from this website if you wish. How to find out where snakes are coming in your house - Any time you have a chronic animal guest inside of your home it is a good indication that there is a damaged area of the building letting the animal inside. It is not always easy to tell where snakes are entering the building. Remember that the snake will not wander aimlessly throughout the home. It wants to get out; it’s scared and disoriented. If you discover a snake in your kitchen, check the area outside of the home near the kitchen walls for a likely opening. Snakes love cracks in foundations and gaps under sidewalk stones. Either location can accidentally lead to the interior of a home. Do a thorough examination of the home’s exterior, filling in any cracks and gaps that you discover. Snakes will not re-open holes that have been filled. They lack the teeth, claws, and determination of many other pest animals. A good indication of a snake hole will be signs of frequent use. Smooth areas in the dirt around the opening will indicate something has been using it. If you are extremely lucky, you may find snake poop or a snake skin near the entrance. Do not rely on very obvious signs. Snakes do not leave much evidence of their passing. For information about How to Get Rid of Snakes, click this link.